If you are looking for the original stair climber, then the StairMaster Gauntlet will be your new best friend. 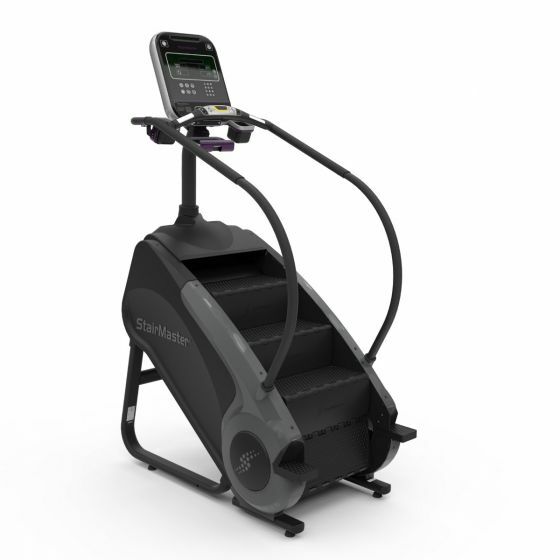 The Stairmaster was first introduced in 1983 and this series 8 model comes with the OpenHub LCD console providing all the essentials for challenging, low impact workouts. With the Stairmaster Gauntlet you get the 'Landmark Challenge' program allowing you to climb well known landmarks from across the globe like the Eiffel Tower, Statue of Liberty and the Taj Mahal. Standard programs are also included with the LCD console option and it also features a 'Hot Bar' with stop button, heart rate and level control. The Guantlet has been developed over the past 30 years based on experience in the gyms and is designed to deliver results. The 8 series combines cardio and strength training in the most comfortable design to date. It features a deeper, wider step surface to provide a workout that is like no other. What makes the Gauntlet so good? This model has an electroically controlled alternator, brake and drive chain to precisely control the stair speed. This allows people of all fitness abilities to exercise smoothly and within their comfort zones. It can be used to develop cardio fitness and strength in the legs but is also great to accomodate into HIIT training. The Guantlet has the largest steps in the range and allows users to move between speeds of 24-162 steps per minute. With numerous program options it really is a must have for any gym or fitness centre! * We recommend having this item professionally installed.